Okay, here’s how it’s been the past 3,600 minutes, or so… I have had some semblence of breakthrough. My hero has really come to my rescue. As heroes should. Determined to help me get rid of this stuff, he’s been eating handfuls of it himself. Actually, it hasn’t been handfuls, just lots of repeated dips into the bowl. Talk about sacrifice. But that was only part 1 of his rescue plan. He also dumped a bunch of it into a Ziplock, took it to work, and gifted it to his administrative assistant, who, in twenty minutes, devoured it. All. Bless her heart, she did her part for me too. This is the hard part, now, cuz I must admit confess that I fell off the wagon. 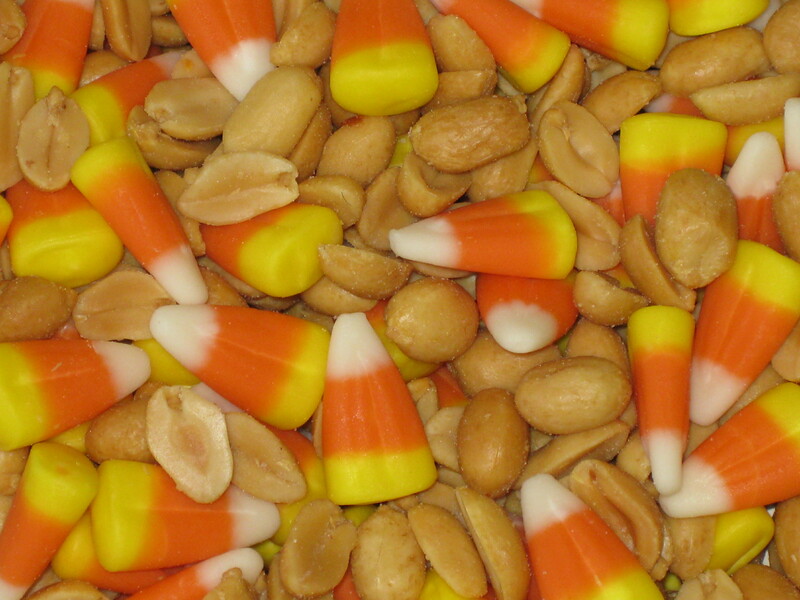 Not meaning to justify myself, or anything, but I have to ask… How many of you have looked at a tempting morsel – or in this case – dozens of tempting morsels – and figured one of the fastest and easiest ways to get it out of your sight was to eat it? Hmmm? Well…I kinda used some of that reasoning too. But, today? I’m an overcomer. Not only did I not touch the stuff, but I went to the gym! Two victories in one day. (See “I Love to Exercise” ) I felt great after and even ate a healthy, vegetable-filled meal. Then spent, oh, the next hour or so, going through those 14-minute waiting periods I told you about. But I made it. Now I’ve only got about 2,160 minutes to go, because the shelf life of this confection ends Saturday morning. At least at this house. Halloween – Best Christmas Shopping Day Ever! October 31st is, by far, the best Christmas shopping day of the year! Except for a sprinkling of parents escorting costumed kiddies from shop to shop for candy, that is one night you’ll find the malls and other stores virtually empty. No parking problems. No empty shelves. No picked-through merchandise. No long lines at check out. Halloween is simply the best night ever, for Christmas shopping – especially if your holiday giving includes charitable organizations. One year, a family I know set aside Halloween for exactly that. Several weeks prior, the parents asked their three teens to not plan anything else for that evening; it was to be a family night instead. Obviously the advance notice was to diffuse teen angst and grumbling, and get them psyched for the forced family fun. Before dark on Halloween, they piled into the family vehicle and escaped to a restaurant for a nice dinner. Then they headed for Wal-mart. Sure enough, the store echoed. They heaped dozens of small goodies on the checkout conveyor belt. Every item had to fit into a shoebox. Though it took a little coaxing, those young people experienced Jesus’ words, “it is more blessed to give than to receive.” (Acts 20:35 NIV). The parents experienced something new that night too – the most peaceful and stress-free evening of Christmas shopping they’d ever had. Oh, how this empty-nester would love to do that again! 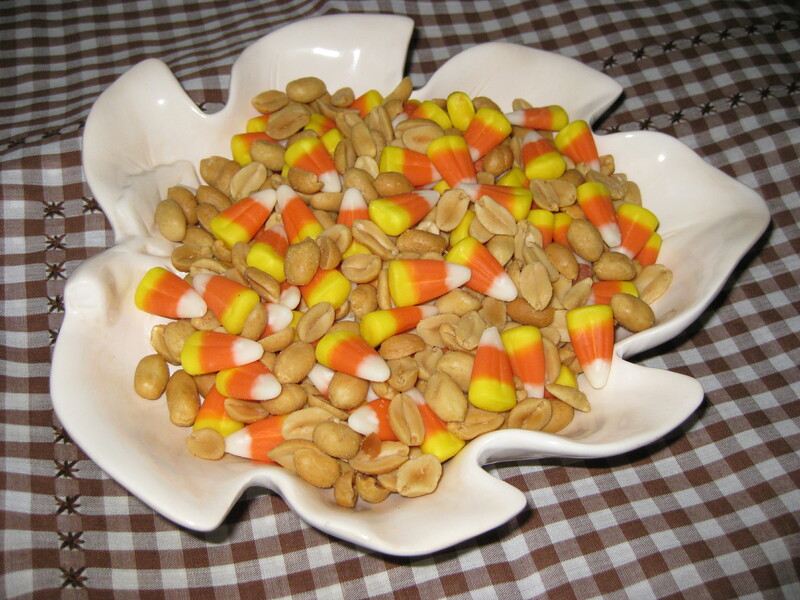 Candy Corn and Peanuts – If You Haven’t Tried This, Don’t! Only a few more days and this craving will pass. Today Shalee at Shalee’s Diner, http://shaleesdiner.com/ posted on her blog about her addictions, and lack thereof. I had already considered confessing my struggle with the seasonal addiction which you see pictured above. So, I guess you could say it was her prodding which clinched it. I happen to know for a fact that there are others out there who also have a craving for this “Salted-nut-roll”-like treat, though I won’t name names. You know who you are. I’ve seen it in your house, like cheeze in a mousetrap, just waiting to capture the hand that gets too close. I’m proud to say that last year, I managed to go the whole season without indulging in above mentioned bait. I cannot say that this year. But, today is a new day. Maybe I can make it. I once read an article which said that any temptation will pass within 14 minutes. So, if I can just wait it out… The way I figure, to endure until Halloween is over, I only have to go through that 14-minute waiting process approximately 412 times. Or 5,760 minutes. I’ll let you know how it goes. This morning I received a link which provides an excellent summary for Biblical-based voting. In countless conversations, I have already spelled out most of these exact same issues which Huntley Brown, a famous black pianist, so eloquently states here. I pray many will take time to read his statement(s). They were not originally intended for the public. I think this makes them all the more sincere, and poignant. And terribly powerful. I encourage you to take time to read them prayerfully. First thing this morning, I followed my hero to the local garage so he could drop off his truck for maintenance. While the mechanic and he took it for a spin to hear the described rattle, I waited in my car, reading my Bible. Oh, it was time well spent. I came upon Psalm 112 and immediately thought of the election. The controversy. The economy. The anger. The fear. These are just a few snippets, (from Zondervan’s RSV). You really must read the whole thing for yourself! May we eschew fear. May we abhor the temptation to compromise in the voting booth. May our ballots reflect faith and confidence in the Lord, and devotion to Him. With all the worldly entertainment thrown at us nowdays, I think we’ve lost much of our ability to spot God’s delights. What a waste! Our nation spends billions of dollars on electronic toys and media fluff, while God offers all kinds of stuff to fascinate us…for free! Like the entertainment He sent us just the other day. 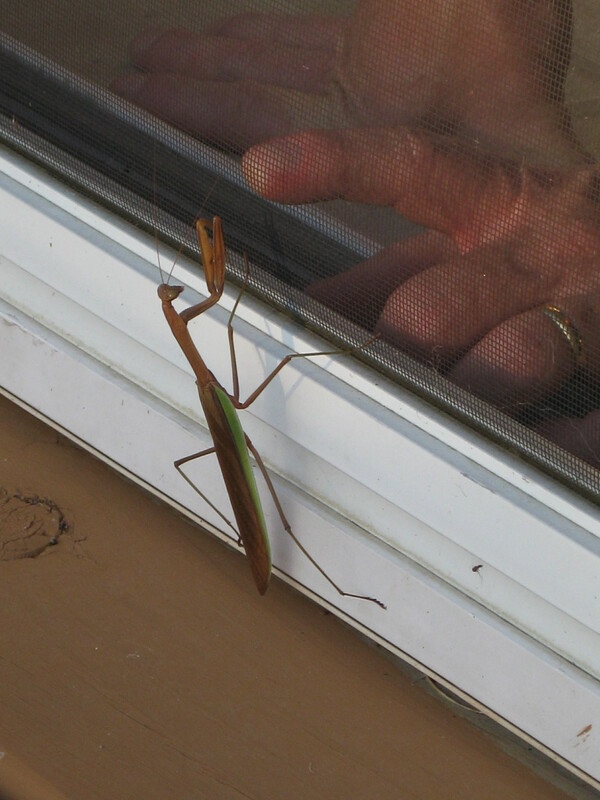 I first noticed God’s visitor as he stood peering through the sliding glass door which leads from our deck into the kitchen. What nerve! To come to our back door and…without knocking…or any kind of announcement…just put his face up to the window like that and stare in at us. Funny how, once I saw him, it brought everything else to a screeching halt. I honestly don’t even remember what we were doing now; I only know that he captured, and held, our attention. 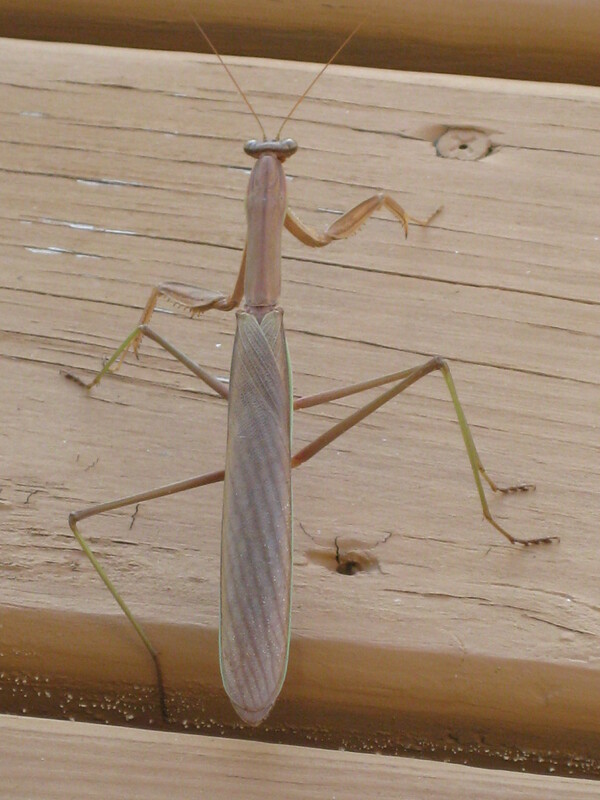 I didn’t invite our guest in, but I did grab my Canon PowerShot, then went around the house and quietly joined him on the deck. 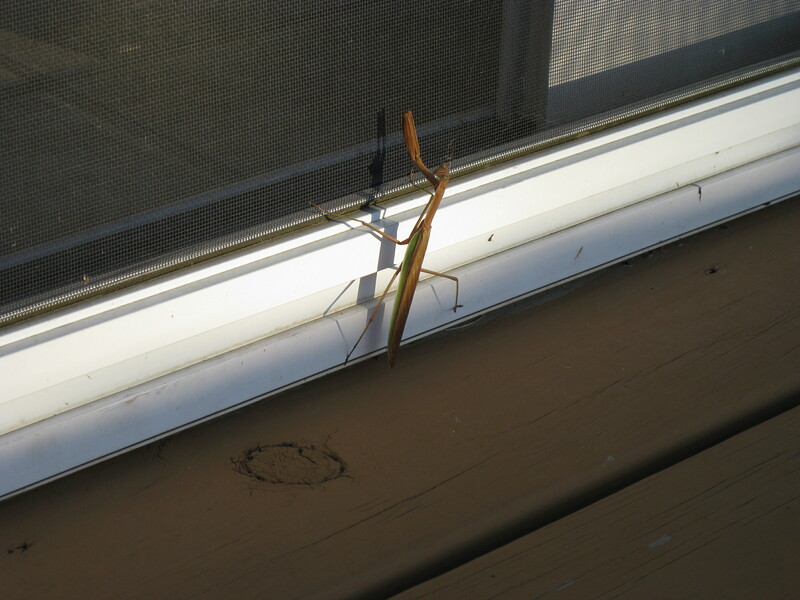 I keep referring to our guest as a “he” but maybe it was a “she,” I’m no entomologist. Then again, take a close look at this shot (below). I discovered that when you click on the photo – remember, I’m still a newbie at this blogging thing – you can get a really close-up view. Is she cute, or what? That’s gotta be a “she.” Look how she’s looking coyly over her shoulder, right into the camera. I also noticed that the caption under the first shot simply says “God.” That is not what I wrote, so I don’t know why it showed up that way. Divine intervention? Next time we need a little fun, I say we ask God to open our eyes to His amusements! They’re free. They’re fun. They’re all around us. And, they’re G-rated. Maybe the emerging economy will help force us into discovering God’s entertainment again. That might not be a bad thing. I just have to do a Part II on our Apple-getting trek. 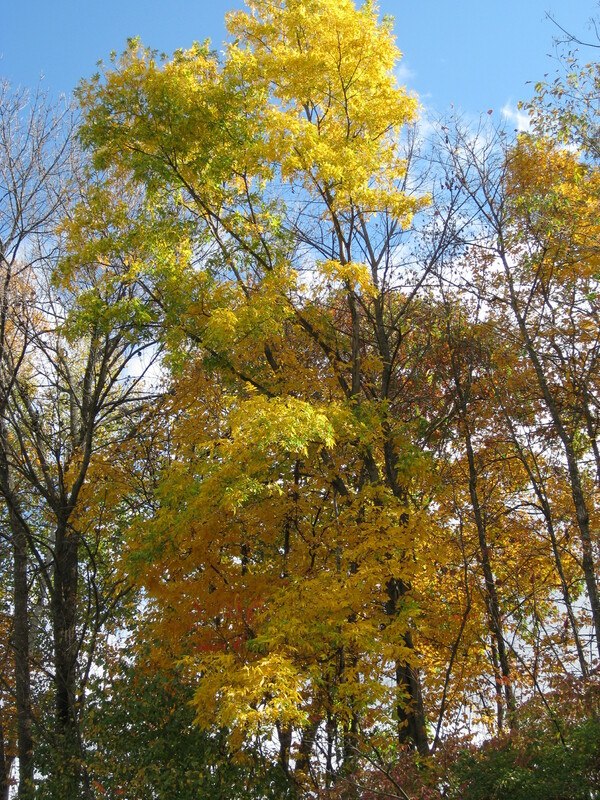 The weather was perfect; the scenery was…well…how could anyone look at such beauty and not believe there is a God?!!! We sampled several different apple varieties, sipped hot cider, and, since it’s only a once-a-year event, wolfed down some of the unspeakably delicious Apple Cider Donuts, for which the Sunrise Orchards are famous. Be forewarned; you should never, ever taste these donuts, unless you want to become a lifetime addict! 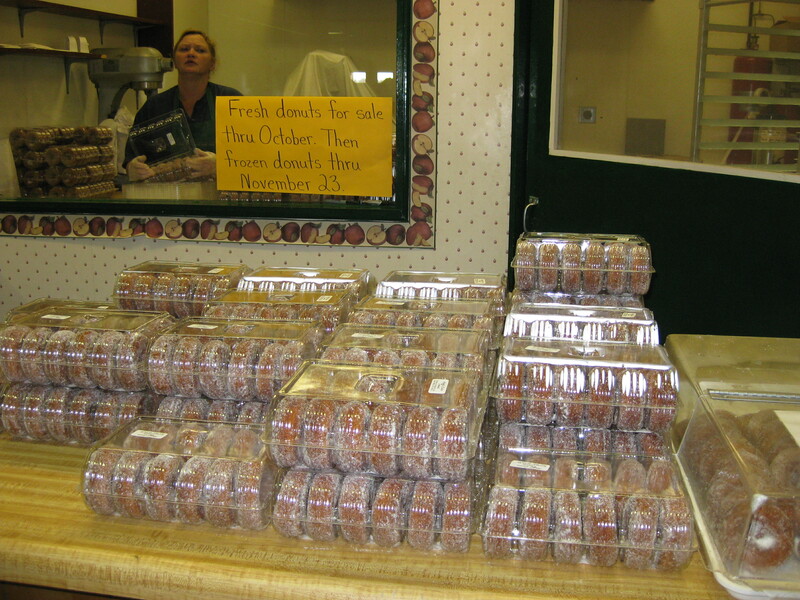 We can certainly find apples in orchards closer to home, but these donuts are worth the several-hours’ drive! Other people must think so, too, though the apples are certainly a draw as well. Even for a middle-of-the-week visit, we were amazed at how busy the orchard shop was; the parking lot was loaded. And the check-out lines were long – but moved right along. Besides, everyone was friendly and cheerful. 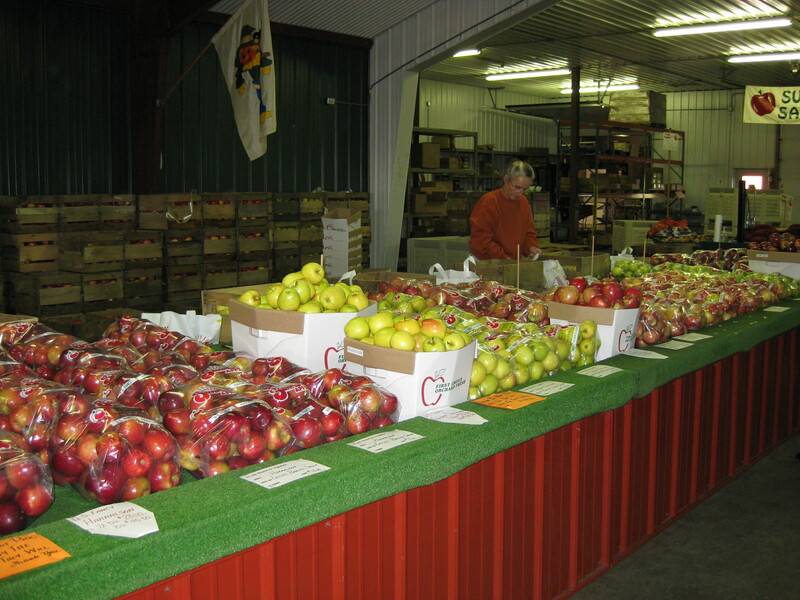 We brought home Honeycrisp, McIntosh, and Harralsons (for freezing – gotta have that stash for pies and crisp!). As we were loading our bounty in the truck, another couple came out of the store shouldering bags of apples too. They promptly packed some in the side boxes of their motorcycle, tied another cooler of ’em on the back, then donned their helmets and vroomed off. 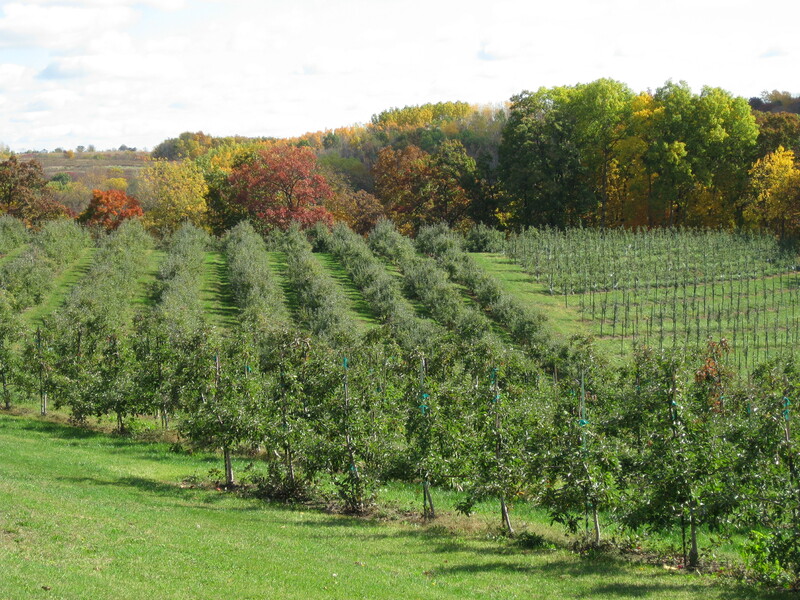 However you get to Sunrise Orchards, it’s worth the trip. And they didn’t pay me a penny to tell you!